Every building needs a roof. If you have a low slope roof a quality installation is not only more imperative, your material choices also become a bit more limited. One of the most popular choices of materials for low slope roofing for the past couple decades is the built up asphalt roof. Some property owners might sway away from using asphalt on their roof in lieu of energy efficiency but a built up roof has different properties compared to residential shingles. In fact, asphalt is just one of the layers of a BUR and it is imperative as a bonding agent for the gravel that makes up the top of this roof. Gravel or some other aggregate blocks out heat, UV rays, and weather and covers the asphalt which forms the job of creating a leakproof seal. Material selection is not only important when covering your low slope roof, so is choosing the right contractor. Rooftoppers has been a constant in the Los Angeles roofing industry – even being located in the same building for the past 30+ years. We are a Golden Star applicator of Certainteed BUR systems which is a distinction not many of our Southern California competitors can boast. We are licensed and insured in the state of California and best of all have the expertise to ensure your built up hot asphalt roofing project proceeds successfully. What is a Built-Up Hot Asphalt Roof? A built up roof is installed just how it sounds with layers upon layers of material creating the roof system as a whole. As you can imagine, each layer performs a distinct purpose and job. A ply sheet is installed and then reinforced with a fiberglass mat. This layer is then covered with asphalt to create a membrane and the whole process is completed again and again based on how waterproof you want the area to be. After all the membrane layers have been completed the roof is topped off with gravel to provide energy efficiency and an aggregate layer of protection against weather elements. Although the installation process is very similar across the built up asphalt roofing application, there are different types of BUR. 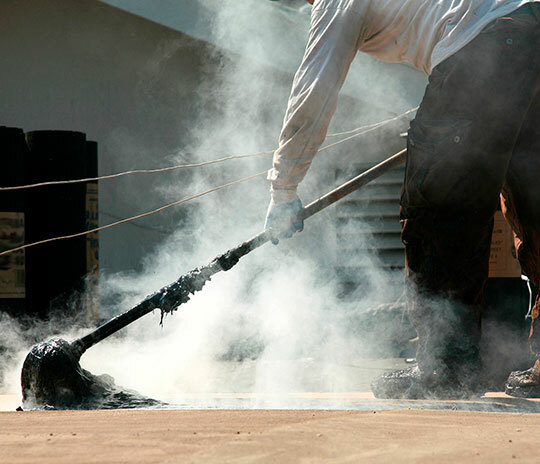 Most vary in the materials used as the bitumen (asphalt) as well as the surface coating. The different types of asphalt might include smooth or ballasted or you can use coal tar or a cold applied adhesive instead of heat application.